Like the new look? It’s still a work in progress as I tweak little things here and there. And a nice project to snap me out of a funk I’ve been in the last few days just feeling a little bored, drained, and overwhelmed all at once from work, life, and sinus issues. 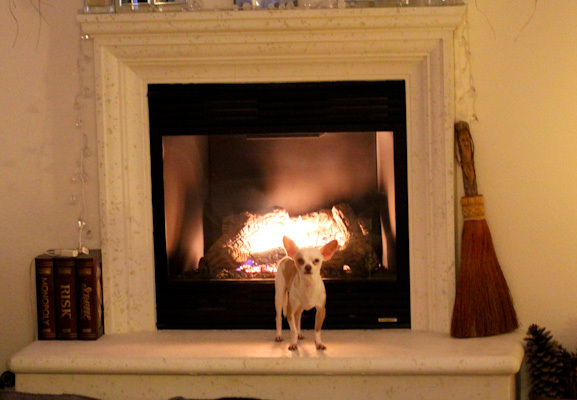 Miko, on the other hand, is as happy and energetic as usual ready to play for hours and be king of the fireplace. He won’t be a happy camper when we stop using it in spring! I’ve really been focusing on saving money so far this year in groceries since the time is coming to do something about my car and I just want to stash more into savings in general. That can be tricky since a lot of organic ingredients aren’t cheap, especially organic dates and nuts. 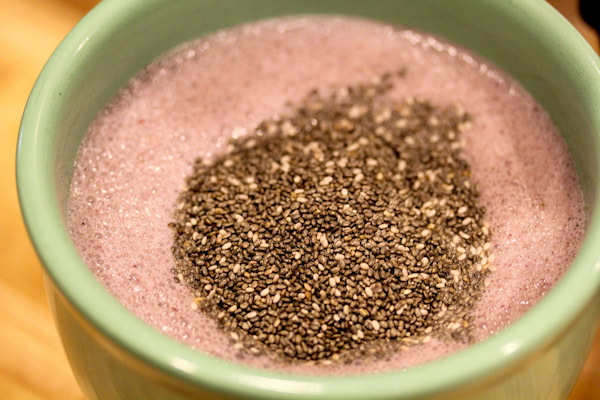 Chia seeds can be a mixed bag price-wise, anywhere from $5 to $13 dollars per pound in my experience. Recently a Sunflower Farmer’s Market opened here and I finally got a chance to check it out over the weekend. It’s very similar to Sprouts Farmer’s Market, but maybe even bigger. I toured most of the aisles comparing prices on products I usually buy, like tahini, nutritional yeast, protein powders, etc. They weren’t cheaper than Amazon for a lot of that stuff, but I did find some deals in the bulk food bins, like organic popcorn, something we go through a lot of in this house! And also organic chia seeds for only $5.99 a pound, much cheaper than Whole Foods. 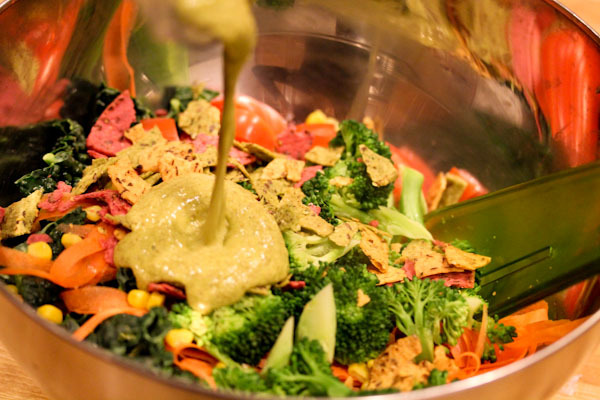 And I’ve been on a bit of a chia seed bender the last few days since I finally restocked the pantry starting with a huge, messy kale salad coated with Gena’s Chia Cheesey Sauce and crumpled flax seed tortilla chips because I was in an odd mood. For an ugly salad, it was wonderful! 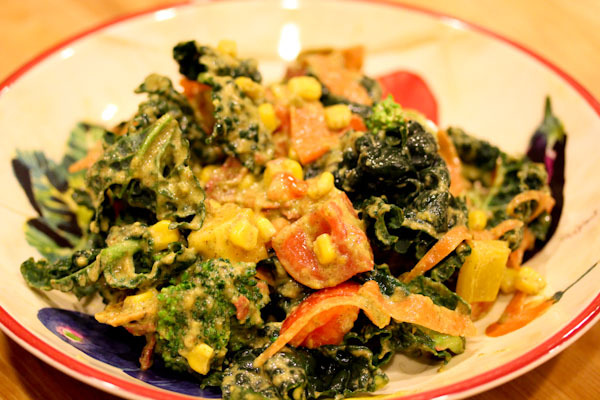 The rich and creamy sauce masked the slightly bitter kale flavor nicely. 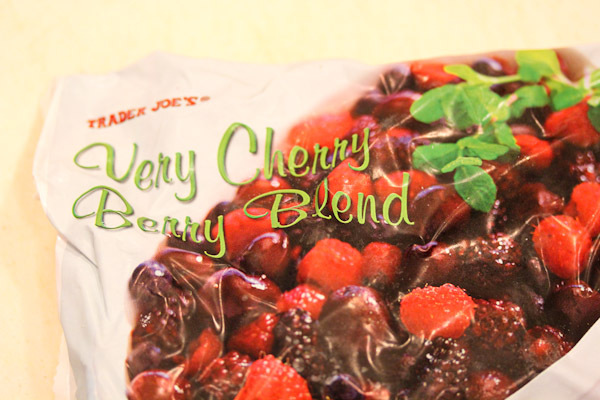 And I created a chia seed pudding using Trader Joe’s Very Cherry Frozen Berry Blend. 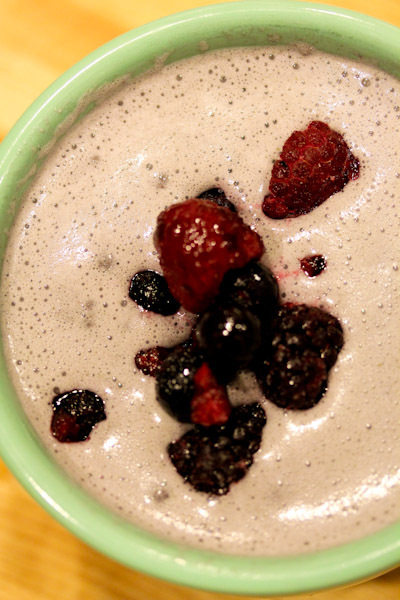 Place all ingredients except chia seeds into a high speed blender and blend to a smooth puree. Stir chia seeds into mixture and let sit for 20 minutes stirring occasionally. 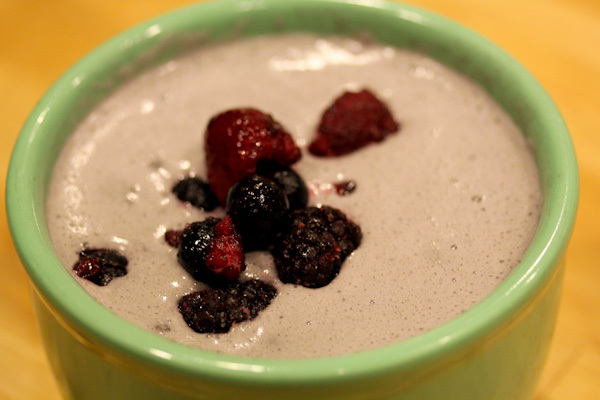 Top with fresh or frozen berries. Makes 1 serving. While this makes a fine breakfast, I actually had it for dinner to stir things up a bit and it was like having a decadent, nutritionally dense dessert for dinner – works for me! LOVE THE NEW TEMPLATE AND HEADER!!! This is so much fresher, lighter, and pretty! Great work. I know all this stuff takes massive TIME and white knuckles! Aw thanks, it only took me an extra month to complete it! :-) Still might tweak the colors and graphics a bit, who knows. Thanks! 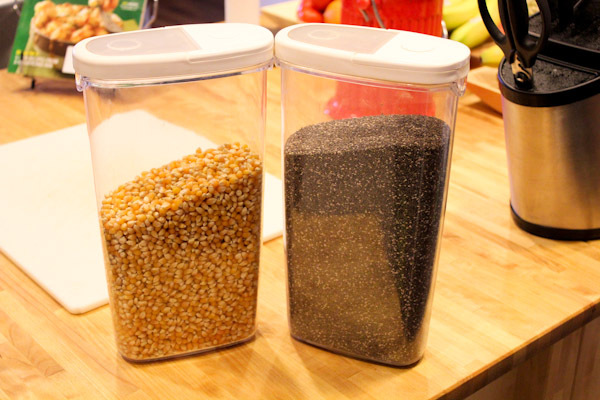 :-) My pantry too, lots of quinoa and lentils to use up. 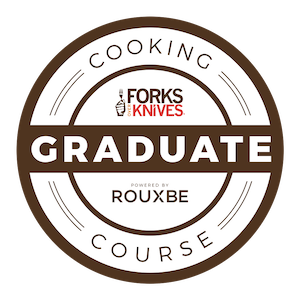 LOVE the new header, and that dessert sounds yummy! Great fresh new look! I like a project to pull me out of a funk, as well. I’d say job well done! The pudding looks and sounds BERRY yummy! Will have to try it! Aside from your comments/description of the salad being “messy” and “ugly” … I’d eat it! Looks can be deceiving when it comes to something that is vitamin, nutrient dense and good for you! For me, I think it was Miko who stole the show (and my heart) on this post! :-) SO cute! Thanks on the look and so true on that being refreshing. Cute on the pudding. :-) I need to work more chia seeds into my diet because I swear they sustain my appetite longer and great energy boasters before a workout.